21/6/10 – Acquisitions – New York, The Metropolitan Museum of Art – We continue our presentation here of recent acquisitions by the Metropolitan Museum  with three 19th century French paintings donated by Mrs. Charles Wrightsman. 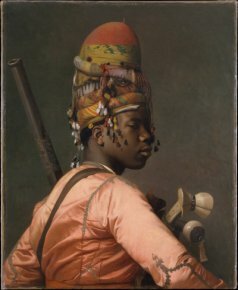 The first, turned over in 2008, representing a Bashi-Bazouk or mercenary of the Ottoman army (ill. 1), is a masterpiece by Jean-Léon Gérôme (who will be highlighted in a retrospective at the Musée d’Orsay this coming fall). The artist traveled to Palestine and Egypt in 1868, returning to the latter the following year. The canvas, from this period (and reproduced in a photograph by the Goupil company), was perhaps painted while on location or else later in Paris, from memory. Eugène Fromentin, who accompanied Gérôme, in fact wrote to his wife from the city of Cairo on 20 October 1869 : “ Not one of us, even Gérôme who, you know, never loses a second, has found the time to do a sketch. ”. The soldiers in the streets of Cairo seemed less threatening than they used to. Paul Lenoir, a friend of Gérôme’s on the trip there in 1868, then again in 1881, wrote about the Arnauts (descendants of Albanian soldiers) and the Bachi-Bouzoks : “While waiting for someone else to invade Egypt, these ornamental soldiers, these comic-opera sentinels have received the order to stop photographers wishing to honour them. 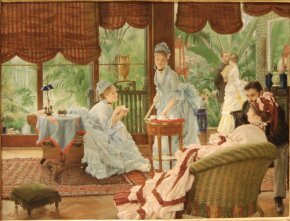 Their artistically neglected costumes, their luxurious arms as brilliant as they are harmless, their proud and scornful attitude, their smallest gesture, all of it seems to have been carefully put into place .” This description fits the painting perfectly, notably the splendid treatment of the fabrics. 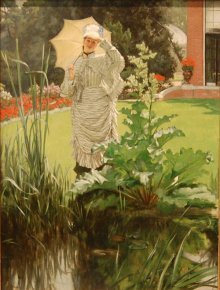 Two more works, this time by Tissot, were donated by Mrs. Charles Wrightman in 2009 who had already offered Tea in 1998 and In the Bright Sun in 2006, (see news item of 10/3/08). These small canvases were painted in London where the painter lived in exile from 1871 until 1887 after having taken part in the Commune. With its newly found wealth of, now, four small Tissot paintings, the Metropolitan Museum needs only – it also owns the Portrait of Tissot by Edgar Degas – to acquire a large format comparable to those which recently joined the Getty (see news item of 31/8/08) and Orsay (see news item of 27/8/08). See the other news items by clicking on the word Metropolitan Museum on the right of the screen. Quoted by Gérald M. Ackerman, Jean-Léon Gérôme, Paris, 2000, p. 88. Quoted in the catalogue Gérôme & Goupil. Art et Entreprise, Bordeaux, Musée Goupil, 2000, p. 124.